A team from the University of Thessaloniki has completed a blueprint for the structural overhaul of the seminary to create living quarters for over 100 students and facilities to host major international conferences. In fact, it is in an odd way perfectly fitting that the place which in ancient Greece was considered the centre or omphalos of the earth - and a place where representatives from the entire Greek world sought counsel from priests and the divining high priestess Pythia who thus became privy to the innermost thoughts and strategies of all the city-states that flocked there, laying bare their most intractable dilemmas - hosted a discussion of another religious institution with a global reach, the Ecumenical Patriarchate, and of the pressing need for Ankara to permit the operation of the patriarchate's Halki Theological Seminary, which it shut down in 1971. Byzantium itself was created by settlers from Megara who were instructed to go there by the Delphic Oracle, centuries before Constantine made it the seat of his empire. The Christian Church of the city that took his name, the Great Church of Christ and Ecumenical Patriarchate, second in rank only to Rome, became and remains the omphalos and diplomatic epicentre of the entire Eastern Orthodox Christian Church. The address to the Delphi Forum of Metropolitan of Bursa (Prousa in Greek) Elpidoforos Lambriniadis on the past and future of the Halki Theological Seminary was not a lament for an injustice that has lasted nearly half a century, but rather an unveiling of ambitious plans for the institution that nurtured and bred patriarchs and theologians. In the nearly eight years since Ecumenical Patriarch Vartholomeos entrusted Elpidoforos (the patriarch himself gave him the name, which means hope-bearer), a theology professor at the University of Thessaloniki and an eminent figure in the Orthodox world, with carrying on his struggle to re-open his alma mater (the graduates of which feel a mystical bond between themselves, the seminary, and the tradition of the Great Church of Christ), he has with bold steps paved the way for the re-opening of the seminary and the revival of Halki as a spiritual and cultural centre – not least with the enlargement on the premises of the seminary of the brotherhood of the Monastery of the Holy Trinity of which he is the Abbott. On his watch, a team from the University of Thessaloniki has completed a blueprint for the structural overhaul that will take place to create living both living quarters for over 100 students from all over the Orthodox world and from other denominations, as well as facilities that will allow the Halki Patriarchal Seminary to host major international conferences on issues from theology to environmental protection, history and culture. Moreover, a project in cooperation with the Greek Parliament to digitise Halki’s splendid library, the jewel in the crown of the seminary (which in the past also had a high school programme with room and board), has automatically placed Halki on the global cultural map. In his address to the Delphi Forum, Elpidoforos insisted that the educational offering must meet the international academic standards of universities regardless of whether the Turkish state recognises the seminary as a university or not. “I believe we must attain a level of studies that meets the specifications required by European and American Universities (Elpidoforos has also taught at the Holy Cross Seminary near Boston) in order to certify degrees of educational institutions internationally. In this manner our school will attain the level it deserves in terms of the recognition of its studies without violating Turkish law,” he noted. Eager to open the seminary to the world and establish it as an international Orthodox and inter-religious dialogue hub, Elpidoforos stressed the importance of English (along with Greek and some Turkish) being one of the seminary’s teaching languages. “Since in all quarters English is the predominant language today, it would be advisable to make it one of the teaching languages, along with Greek and Turkissh. That will catapult the seminary internationally, will allow the unhindered exchange of professors and students with other universities, and will facilitate inter-university cooperation more generally. To achieve the best results it would be useful to establish a one-year course of preparatory study of the Greek and English languages and of introductory theology courses,” Elpidoforos said. The current buildings on the idyllic campus are suitable for housing 25 students annually, and the objective is to increase that capacity to over 120, including the students in the preparatory year. The new Halki Seminary will have to have complete freedom to register students from abroad, as the dwindling Greek minority lacks the numbers to cover the many needs of the Ecumenical Patriarchate’s international ministry. The same freedom must apply to the hiring of professors (who must have a PhD) so as to establish the best possible academic standards. Aside from the standard course of studies of theology faculties such as those of Thessaloniki and Athens, the Halki seminary will also focus closely on areas of study that touch directly on the needs and activities of the ecumenical ministry of the Patriarchate of Constantinople. These include the position and role of the Ecumenical Patriarchate within Eastern Orthodoxy and in Christrendom more generally, inter-confessional dialogue within Christianity (with a view to peaceful coexistence, cooperation, and future union), and the theological approach to environmental protection, a longstanding focus of Vartholomeos, who has earned the title of “green patriarch” in the international community. The Ecumenical Patriarchate’s initiatives for inter-faith dialogue with Islam and Judaism will also be a key area of focus in the programme of studies. Elpidoforos has placed great emphasis on the role of the library, which has been digitised and organised as never before on his watch. He told the Delphi Forum that the EU’s Erasmus programme pays the wages of students from various Greek universities which have concluded agreements with Halki to who work on the electronic cataloguing and restructuring of the library. Since 2012, over forty university students from Greece have participated in the programme. Despite Ankara’s continuing ban on its operation, the Halki Seminary has with persistent and arduous efforts begun its transformation into a spiritual and cultural centre of international repute. “Since the School has not yet opened, we decided to open its doors on our own with a wide variety of activities. We began hosting academic conferences, academic meetings, book presentations, art exhibits, concerts with traditional music, and more. Most importantly we opened our monastery to the world. One can tour its gardens and its interior halls, venerate and pray in the church, and study in our library,” Elpidoforos declared. In his address to the international political and economic players and movers and shakers of the Delphi Forum, Elpidoforos outlined how the nearly 50-year silencing of Halki has been a losing proposition for all parties involved. “Who lost? The Ecumenical Patriarchate lost its only institution for educating its own clergy in its own way. Orthodoxy lost because a beacon of theological thought with deeply Orthodox and traditional roots was snuffed out. Christianity lost because a breeding ground for workers of the Gospel who believe in the unity of the divided Christian Churches was laid to waste,” Elpidoforos underlined. For Elpidoforos, the closure of the Halki Seminary represents a deep loss for Islam and inter-faith understanding. “Islam lost out because it was deprived of the opportunity to have all over the world Christian leaders with a positive experience of peaceful coexistence with Islam. It is no secret today that the Western world – Europe and the US – is at a loss when it comes to dealing with Islam, including the rise of Islamist violence and the presence of millions of Muslim refugees in Europe and other Western countries. At times it treats Islam with excessive aggressiveness and suspicion, and at other times it deals with it in an exceedingly loose, comparativist manner that ignores Islam’s history, teachings, and chaaracteristics. For Halki and the Phanar more generally, however, Islam has been a part of its daily reality for centuries, a daily reality of coexistence and cooperation that has much to teach us,” Elpidoforos noted. “By the simple opening of one educational institution, Turkey would leap ahead in the list of countries that respect the human rights and religious freedom of its citizens. That may leave certain Turkish domestic circles disgruntled, but are they not always dissatisfied anyway? 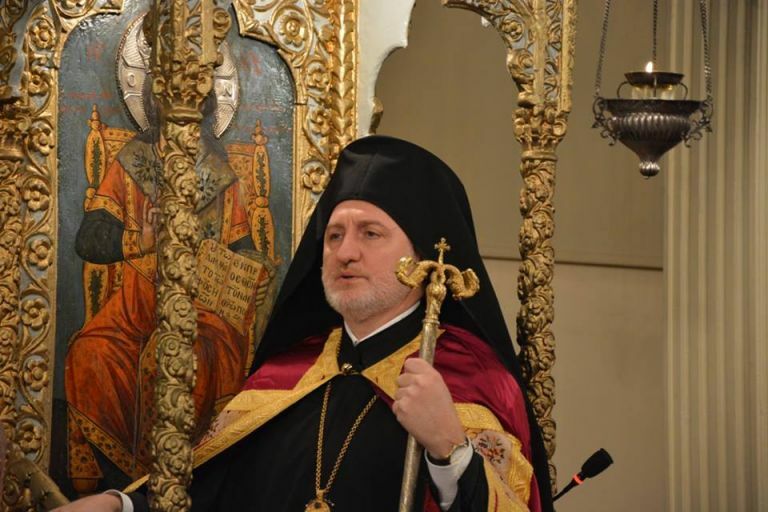 It is necessary to abandon the stereotypes in which we have become entrapped, to lift our heads high and to gaze on the future by transcending the clouds of prejudice and old, dark mentalities,” said the Metropolitan of Bursa.